Well, Whatever Happened To The World's Fastest Man ? 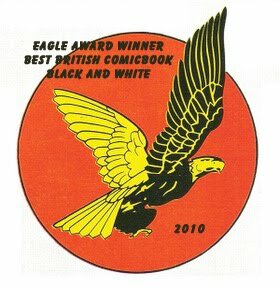 was nominated for the 'Best Comic of the Year You Probably Haven't Heard of' award over on http://scans-daily.dreamwidth.org/1715467.html?thread=55955211. Nice to be on the list with such great titles. 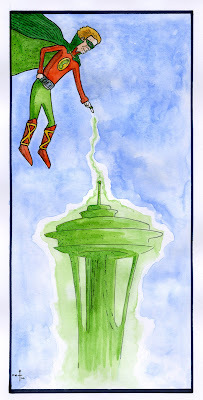 This one is for Jim Schwitzer of 'Tales From The Parent's Basement' fame ... over the weekend of the Emerald City Con Jim asked if I'd had a chance to do an Alan Scott - Green Lantern image in my 'style' ... I hadn't and apologised ... but in discussing it with Colin on the flight home we both had the same idea for what the image would be. I know .. it's an obvious title for this entry but so apt. A plane flight of some 10 hours or so, hit me pretty hard. I found myself waking up at around 2.30am every morning, even if I'd gone to bed at around 12.30am. In fact, and typically, the one morning I didn't wake until 7.00am, was the day we came home. OK, so it was a long way to go, but was it worth it ? This was never going to be financially viable, we knew that going in. In fact I don't think we could have shipped enough comics out there to balance the price of air fare and hotels. What this was all about was meeting people (both friends from Tales From The Parent's Basement and new collaborators and customers), getting Accent UK books in front of people who had never heard of us, meeting retailers and showing them what we produce and seeing some of Seattle. We acheived all of our goals. The guys from Tales From The Parent's Basement were great, to a man, and great hosts for our shared table. We had a load of fun with them and they introduced me to Burretos and reintroduced me to Churros. A quick thank you to them all. 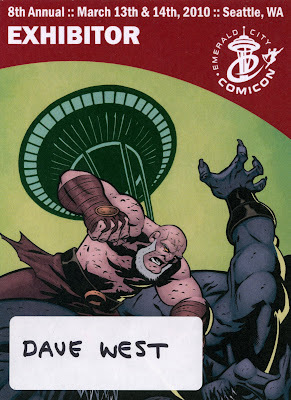 We sold a whole heap of comics, ZOMBIES proving most popular (as always), met a load of new customers, met our Vancouver counterparts Cloudscape (again nice people), met Val Mayerik who will be contributing to a future anthology and maybe more. We talked to about a dozen retailers, all of who seemed genuinely interested in our books, and some of whom already stocked them. This was a great response and something we need to do more of. Vanessa, Wei and Wai of the Vancouver Collective, Cloudscape, were all very nice and as enthusiastic about the independent comic scene as we are. Hopefully we'll be able to support eachother in the future from different sides of the Atlantic. We also had a interesting chat with Val Mayerik, who does a pretty decent London accent, and he's shown a lot of interest in working with us in the future. Bald Eagles in Pioneer Square, never seen before, was a fitting end to a great 4 day adventure. We're not sure we'll visit the same Con for a while, but it has certainly got us looking to attend more US cons ... we'll aim for 1 a year I think. I'll be putting up a more comprehensive report on the Accent UK website in the coming weeks ... with photos etc. I need to get some rest now .. the jet lag hasn't finished with me yet.